Mango Lassi Gelato with Matcha Chocolate Drizzled on top - Yes I love my MATCHA! Today, I stayed cool with Gelato from Bella Gelateria, and gosh was it amazing! I had the Mango Lassi Gelato with Matcha Chocolate drizzled on top and garnished with a hazelnut wafer. And of course I had it in the waffle cone! I realize you must be wondering who on earth pairs mangos with matcha, but you know I love my Matcha Lattes so of course I needed Matcha Chocolate drizzled!!!! 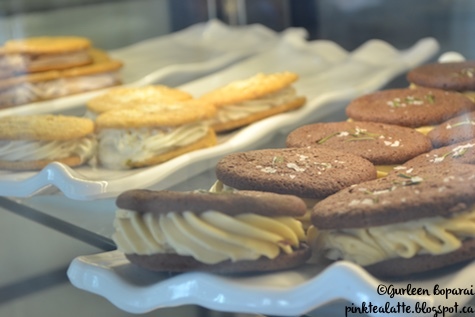 Gelato Cookie Sandwiches | The cookies are baked in house too! All of Bella's gelato and sorbets are made in store in the gelato laboratorio, in fact, you can watch the gelato masters hard at work creating the next amazing flavour! They use the freshest ingredients for their gelatos and sorbets; therefore, many of their flavours are seasonal. So if you are tasting seeds in your strawberry sorbet, it is because fresh strawberries, from a farm in Langley, were used in the sorbet! As well, each flavour is made small batch, so you know it was made within the week. AAAHHHH MATCHA CHOCOLATE FOUNTAIN + DARK CHOCOLATE FOUNTAIN. Thank you amazing Bella Staff for taking this picture for me! My favourite part about Bella was their Matcha Chocolate Fountain! MATCHA CHOCOLATE FOUNTAIN!!!!! It took every ounce of strength I had to not climb over the counter and put my face into the delicious green liquid gold! 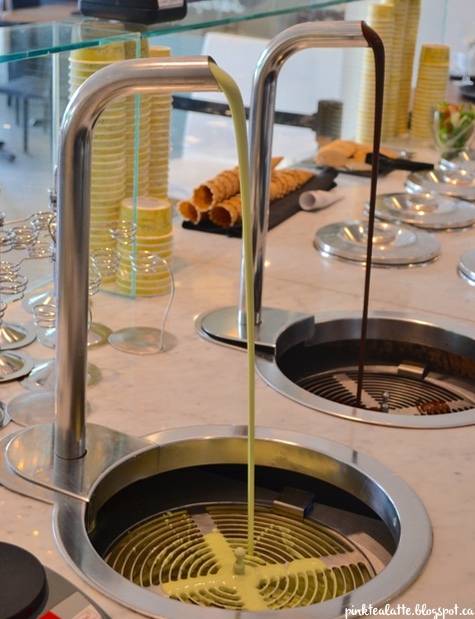 They also have a dark chocolate fountain, but of course I was captivated by the Matcha! So when you go to Bella, be sure to ask them to have your icy treat dipped in Match Chocolate! 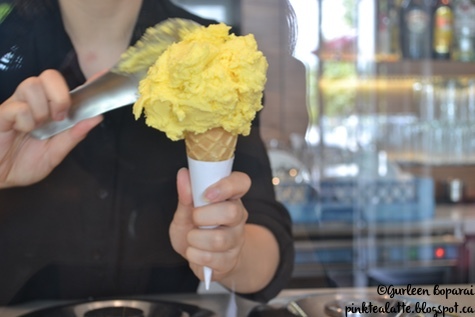 My Mango Lassi Gelato is being crafted by the skilled staff at Bella Gelateria! 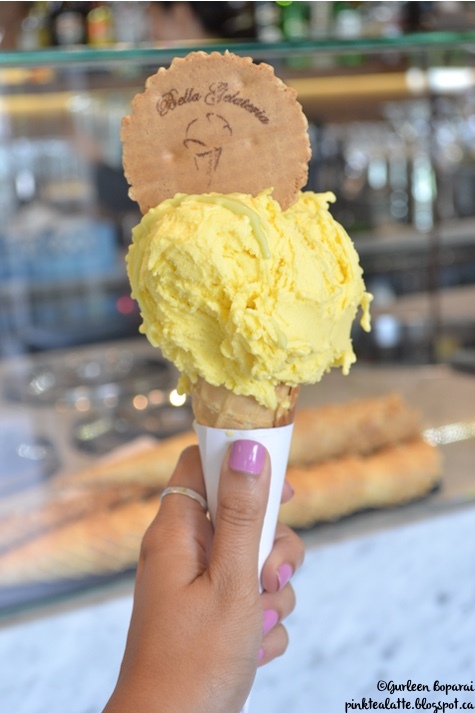 Bella is definitely a jewel of Yaletown when it comes to gelato and sorbet! Bella is located on the waterfront, so grab your cone and be sure to walk along the seawall this summer! I will be doing another post in the future on Bella's pizza because OH MY GOSH, their pizza is too good for words! Edible Obsessions | Melu Juice Soft Opening! 7 Lattes & Wishes // July Wishlist!